The Mungo Man (also known as Lake Mungo 3) was an early human inhabitant of the continent of Australia, who is believed to have lived about 40,000 years ago, during the Pleistocene epoch. His remains were discovered at Lake Mungo, New South Wales in 1974. The remains are the oldest anatomically modern human remains found in Australia to date, although his exact age is a matter of ongoing dispute. Recent controversial analysis of Mungo Man's mitochondrial DNA has also led some researchers to challenge the single-origin hypothesis of human evolution. The Mungo Man was discovered by ANU archaeologist Dr. Jim Bowler on February 26, 1974 when shifting sand dunes exposed his remains. 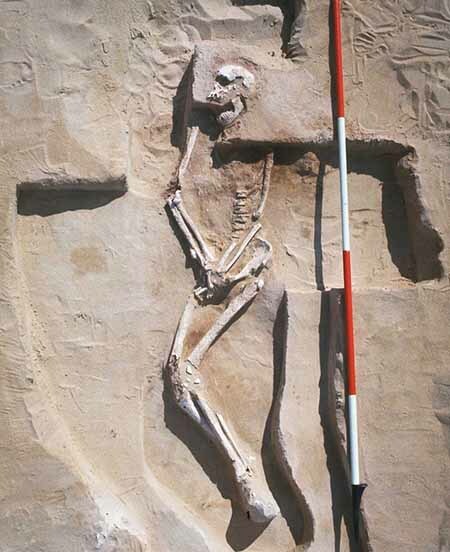 He was found near Lake Mungo, one of several dry lakes in the World Heritage listed Willandra Lakes Region. The body was sprinkled with red ochre, in what is the earliest incidence of such a sophisticated and artistic burial practice. This aspect of the discovery has been particularly significant to Indigenous Australians, since it indicates that certain cultural traditions have existed on the Australian continent for much longer than previously thought. The skeleton had been somewhat poorly preserved, with substantial portions of the skull missing, and most of the bones in the limbs suffering surface damage. Some anthropologists have noted that it may not be possible to conclusively determine the gender of the remains, although they are most commonly referred to as being male. Mungo Man was buried lying on his back, with his hands interlocked over his groin. Based on evidence of osteoarthritis in the lumbar vertebrae, and severe wear on the teeth, it seems likely that Mungo Man was quite old when he died. New studies show that, using the length of his limb bones, it is possible to estimate Mungo Man's height at an abnormally tall 196 centimetres (77 inches or 6 ft 5 in). The first estimate of Mungo Man's age was made in 1976, when the team of paleoanthropologists from the Australian National University (ANU) who excavated Mungo Man published their findings. They estimated that Mungo Man was between 28,000 and 32,000 years old. 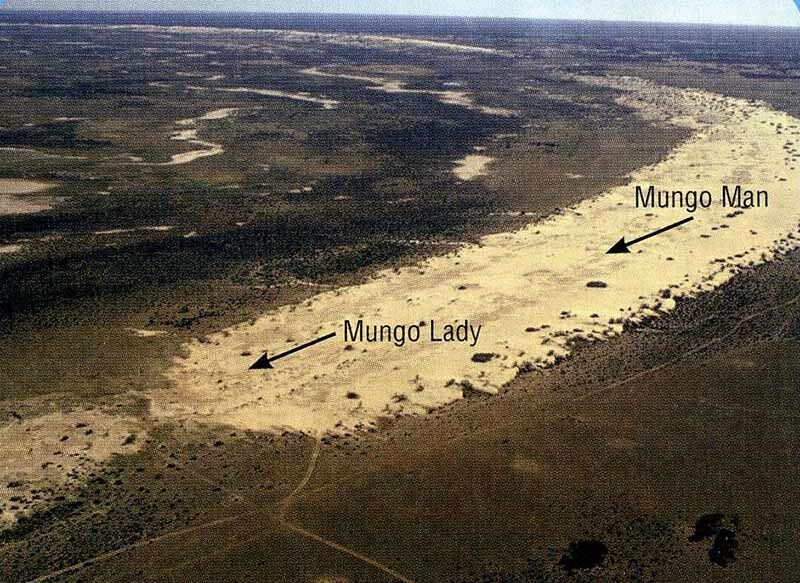 They did not test Mungo Man's remains directly, but rather established an estimate by stratigraphic comparison with Mungo Lady, an earlier set of partially-cremated remains also found at Lake Mungo. In 1987, an electron spin resonance test was conducted on bone fragments from Mungo Man's skeleton, which established an estimate of his age at 31,000 years, plus or minus 7,000 years. In 1999, another team from ANU arrived at a new estimate of 62,000 years, plus or minus 6,000 years. This estimate was determined by combining data from uranium-thorium dating, electron spin resonance dating and optically stimulated luminescence dating of the remains and the immediately surrounding soil. However, this estimate was very controversial. Some scientists pointed to evidence of the age of strata at the lowest level of the Lake Mungo archaeological site, which are as old as 43,000 years, to show that Mungo Man could not be older than this. However, the ANU team had dated the strata itself to be between 59,000 and 63,000 years old. Others criticized the problems with using uranium-thorium dating on tooth enamel. In 2003, a group of scientists from several Australian universities, led by the University of Melbourne, reached a new consensus that Mungo Man is about 40,000 years old. This age largely corresponds with stratigraphic evidence, and used four different dating methods, and brought together scientists from several different universities. The age of 40,000 years is currently the most widely accepted age for the Mungo Man and makes it the second oldest anatomically modern human remains found outside of Africa to date. The study also found that Mungo Lady was a similar age to Mungo Man, and not 30,000 years old, as previously thought. This made Mungo Lady the oldest cremated human remains yet discovered. In a study conducted by Australian National University graduate student Greg Adcock and others in 1995, mitochondrial DNA was collected from bone fragments from Mungo Man's skeleton and analyzed. The mtDNA was compared with samples taken from several other ancient Australian human skeletons, a Neanderthal mtDNA sequence, modern day living Australian Aborigines, and other living humans. The results showed that despite being anatomically within the range of fully-modern humans, Mungo Man was descended from a different direct maternal ancestor than the most recent common ancestor in the female line of all living humans, the so-called "Mitochondrial Eve". His mtDNA is not entirely extinct, however, as a segment of it is found inserted in nuclear chromosome 11 of many people today. The study has been controversial because it is claimed to present a challenge to the "Recent Out of Africa" theory of human evolution, which holds that all humans are entirely descended from common ancestors who originated in Africa within the last 200,000 years. The study authors proposed that their results support the multiregional hypothesis, which holds that traits of modern humans evolved in several places around the world, and that gene flow created the genetic uniformity seen today, not a recent migration of a single population from Africa. However, this is not in conflict with the Out of Africa model, as the Mitochondrial Eve mtDNA type and the Mungo Man mtDNA type may have both spread from Africa, with one maternal line going extinct and one surviving to today. The time of the split between Mitochondrial Eve and Mungo Man's maternal ancestor must have been earlier than the date when the main wave of fully modern humans left Africa, about 50,000 - 60,000 years ago. Since remains of a robust form of modern humans have been found in Ethiopia dating to about 160 ka, and similar remains have been dated at Jebel Qafzeh in Israel at about 100 ka, it is conceivable that Mungo Man's maternal ancestor left Africa in an early wave. Indeed, Schillaci has recently found morphological similarities among the crania of early humans of the Levant and those of Australasia. The study by Adcock has been criticized by a study conducted by Chris Stringer. Adcock claimed to have found an exceptionally large amount of ancient DNA from the Mungo remains. This finding is inconsistent with other researchers who were searching for Neanderthal DNA. The study indicates that Ancient DNA is most likely preserved in cold environments such as those found in Europe. But even in the case of Neanderthal remains, the probability of extracting DNA is still low. The study further indicates that the likelihood of any DNA being preserved over the 40,000 - 60,000 years since the Mungo burial is very low. The Mungo Lady (also known as Mungo I) is one of the world's oldest cremations discovered at Lake Mungo, New South Wales, Australia in 1969. The finding implies complicated burial ritual in the early human societies. The Mungo Lady (also known as Mungo I) one of the world's oldest cremations discovered at Lake Mungo, New South Wales in 1969 by Professor Jim Bowler with the University of Melbourne. The reconstruction and description were mainly done by Alan Thorne at the Australian National University. 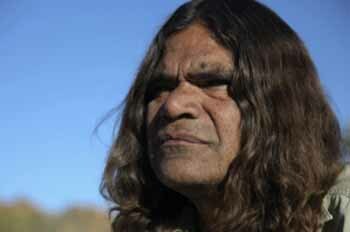 Researchers have found evidence that demonstrates Aboriginal people were the first to inhabit Australia. The work refutes an earlier landmark study that claimed to recover DNA sequences from the oldest known Australian, Mungo Man. This earlier study was interpreted as evidence that Aboriginal people were not the first Australians, and that Mungo Man represented an extinct lineage of modern humans that occupied the continent before Aboriginal Australians.